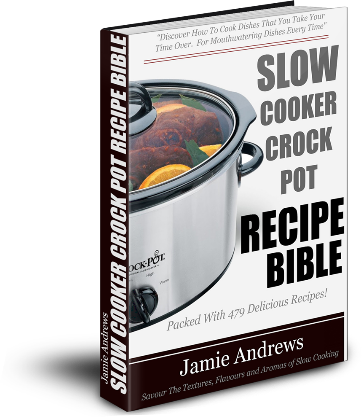 Slow Cooker Crock Pot Recipe Bible! So, nearly all of us have one of these incredible cooking tools tucked away in 0ur kitchen cupboards, possibly gathering dust, and left alone for the day that you decide you want to make a “soup” or a “stew” right? Or maybe you just got one as a gift and you are wondering when you will ever use it! Well did you know that you can use this ingenious invention to create gorgeous meals that your family will adore, and that you can do that with a lot less hard work than ‘normal cooking’? These days we all have busy lives, and let’s face it, 9 times out of 10, the last thing you feel like doing at the end of the daye is cooking a dinner! So your family either ends up with takeways more than they should or you throw together a meal that is less than tasty and lacking in inspiration! Sound familiar? I needed a solution to this problem and I found it with the crock pot. One day I dug out my old crock pot and started searching for dinners I could make for the family. I was surprised to find not only great and tasty main dishes, but desserts and side dishes that you can make with ease. You can prepare the basis for your meal in the morning when you are feeling ambitious and then when you come home from work all you need to do is prepare a side dish and you will have a great meal for the family to sit down to. After discovering how much time and money I was saving using my crock pot. I thought, Wow! There are a lot of people that could benefit from using there crock pot to it’s full potential, so I gathered up all the recipes that I had found and put together an eBook that any one can use, packed with 479 of the best recipes. In the Slow Cooker Crock Pot Recipe Bible you will find tasty main dishes, side dishes and even deserts that can be prepared in your crock pot. How would you like to come home this evening to a dinner of Chinese Pepper Steak? Or how about Autumn Pork Chops, Jambalaya, or Fiesta Chicken? Maybe a Beef Casserole or Ham and Scalloped Potatoes would satisfy the taste buds. Whatever your families tastes, you’re sure to find a crock pot recipe inside Slow Cooker Crock Pot Recipe Bible to help you make the perfect meal. Order The Slow Cooker Crock Pot Recipe Bible for only 3.95 and you can be making these time and money saving recipes for your families dinner immediately! This comprehensive recipe book is packed with 480 pages of delicious slow cooker recipes that will amaze you and delight your family and friends. Here are just some of the things that you will be able to cook! Go ahead and treat yourself (and your family). There are 479 recipes to choose from! BUT THAT’S NOT ALL! WE ARE GIVING AWAY SIX FREE BONUS EBOOKS!